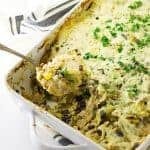 You can always count on lasagna to be a people-pleaser and this creamy chicken lasagna with einkorn noodles is bound to fill the bill and the tummies. Our Lasagna is made up of fresh einkorn noodles, chicken, mushrooms and sun-dried tomatoes. Slices of Havarti cheese are layered together in a creamy, béchamel sauce and topped with a golden crunchy crust. What is not to love about lasagna? 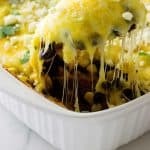 It is a one-pot meal, it is hearty and nutritious, it can be made in advance and baked on demand, it is versatile, enjoyed as a meat or meatless entree, reheats well and it is freezer-friendly. 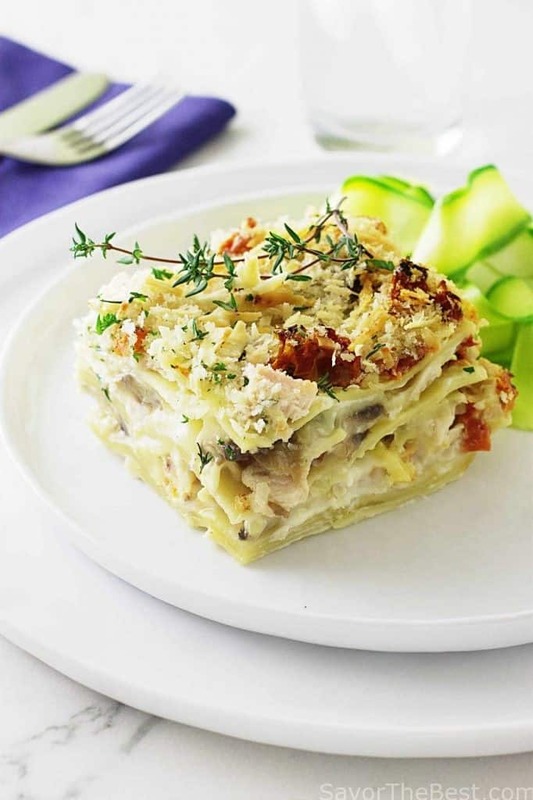 Lasagna translates as ‘layers’ and we have layered this dish between strips of tender, homemade einkorn noodles, cooked chicken, fresh mushrooms, chopped herbs and sun-dried tomatoes. 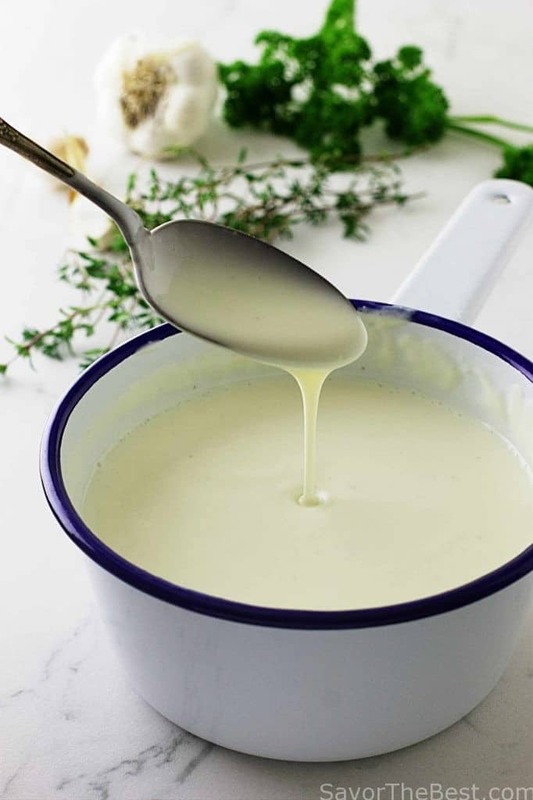 The creamy béchamel sauce with it’s mild garlic flavor lightly moistens the dish. Havarti cheese melts a smooth and buttery and we added slices of this cheese between the layers adding a rich creaminess to the dish. When you dig your fork into a warm, oozy serving of this lasagna you can almost hear the crunch of the golden brown Panko and Parmesan cheese topping. The recipe is wonderful if you use dried packaged pasta or fresh pasta but if you have not tried using fresh pasta, you really should give it a go sometime. Fresh pasta has a wonderful silky, tender texture and a rich flavor. We used fresh einkorn pasta in this recipe. The einkorn flour has it’s own uniquely rich and nutty flavor and is one of our favorites. Flavor aside, einkorn is a healthy, nutritious grain. It is low in gluten and easier to digest than modern wheat. We would love to hear from you if you have tried einkorn flour and if you haven’t we really recommend starting with our fresh pasta recipe which is incredibly easy to make and will give you a good taste of the wholesome goodness of einkorn. We recently posted a recipe for fresh einkorn pasta and we have used the recipe to cut wide strips for our lasagna. 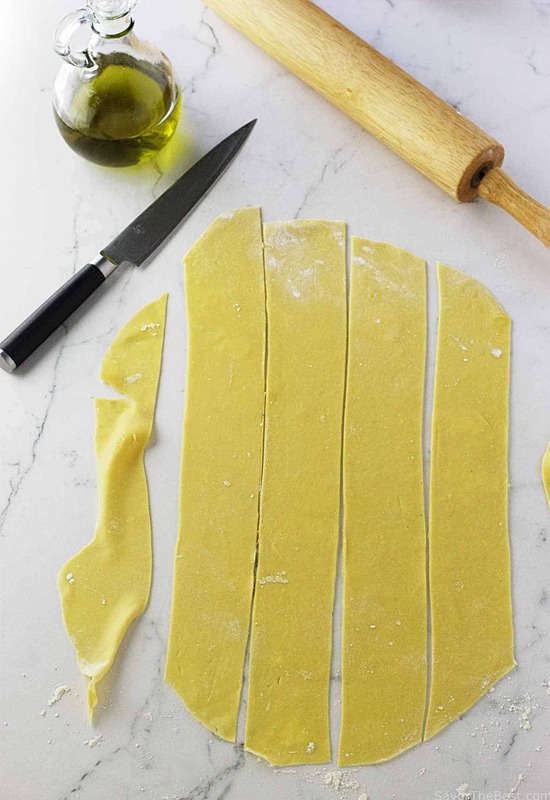 The pasta dough was rolled to 1/8-inch sheets and then cut into strips 12-inch long and 2-inches wide. Another option that works well is to cut the sheets of pasta to the size of your dish and layer as one whole noodle rather than strips of noodles. Fresh pasta cooks much faster than a box of dry noodles and 30-seconds is all that is required. 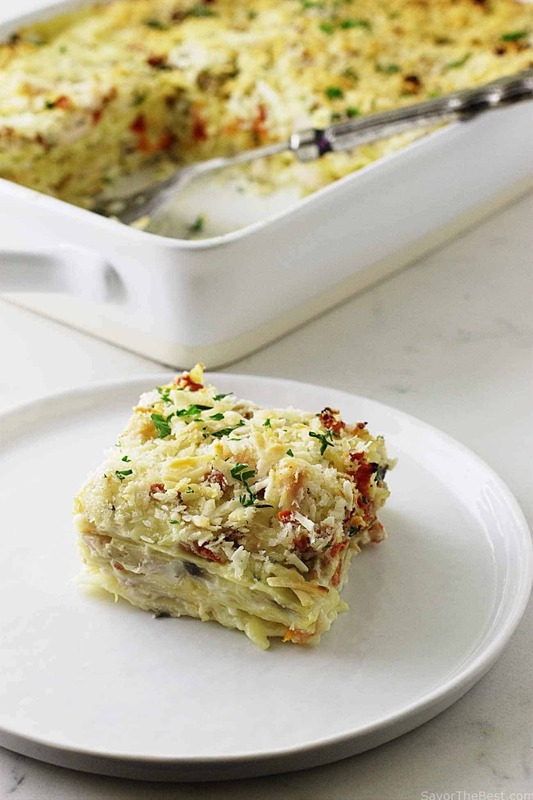 A word of caution….over-cooking the pasta will result in a mushy lasagna dish. This is true with fresh or dry pasta and it is best to slightly under-cook the pasta as it will continue to cook while baking. Fresh pasta always tastes best used in any lasagna dish and it really is easy to make yourself. If you decide not to make your own pasta you can substitute with either the store-bought fresh pasta or the boxes of dried lasagna. Either way, this is a mighty tasty week-night or party lasagna. 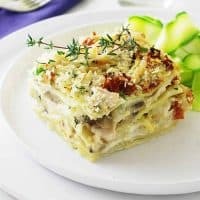 Our Lasagna is made up of fresh einkorn noodles, chicken, mushrooms and sun-dried tomatoes and slices of Havarti cheese are layered together in a creamy, béchamel sauce and topped with a golden crunchy crust. Preheat the oven to 375°F…Spray a 9x13 oven-proof casserole dish with non-stick oil and reserve. Prepare the Fresh Einkorn Pasta, and cut 12 strips of noodles 2-inches wide and 12-inches long. Cook according to the instructions and reserve. Melt the butter in a large saucepan over medium high heat. Add the garlic and sauté until fragrant, stirring continuously to avoid burning. Add the flour and salt. Whisk and cook for 1-2 minutes. Add the milk, one cup at a time, whisking after each addition and allowing it to thicken slightly each time before adding the next cup. When the sauce is smooth and thick, remove from heat, cover with a lid and set aside. In a medium-size bowl, combine the Parmesan cheese and the Panko bread crumbs and reserve. Add 1 cup of the cream sauce to the bottom of the dish and spread evenly. Place 4 lasagna noodles on the sauce, overlapping each noodle. Add 1/3 of the chicken, 1/3 of the sun-dried tomatoes, 1/3 of the sliced mushrooms, 1/3 of the thyme leaves and 1/3 of the chopped parsley. Cover the layer with 6 slices of the Havarti cheese. Repeat, beginning with 1 cup of the sauce for the 2nd and 3rd layer and ending with one cup of the sauce over the top. Sprinkle the reserved topping evenly over casserole. Spray a sheet of foil with non-stick oil and cover the top of the casserole lightly. Transfer to the middle of the oven and bake for 30 minutes. Remove the foil and bake an additional 20-25 minutes until the cheese and sauce has begun to bubble up around the edges and the top is a golden brown. Transfer the lasagna to a wire rack and let stand for 20-30 minutes before serving. Sprinkle with additional thyme and parsley when ready to serve. Measure the tomatoes into a fine-mesh sieve and drain off the oil. I like to run warm tap water over the drained tomatoes to further remove excess oil. Spread the drained tomatoes onto a thick layer of paper towels and cover with additional paper towels and blot off excess moisture/oil.Dried tomatoes may be substituted by rehydrating them. Love lasagna! And this one is a dandy — something a bit different. More than a bit different, actually. Really creative — thanks. 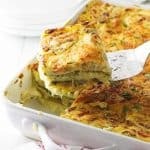 It’s nice to see a none tradional lasagne that looks and sounds delicious. The mixture if flavours you’ve used sound like a perfect combination. A good winter warmer dish. You are right, there is nothing not to love about lasagna! 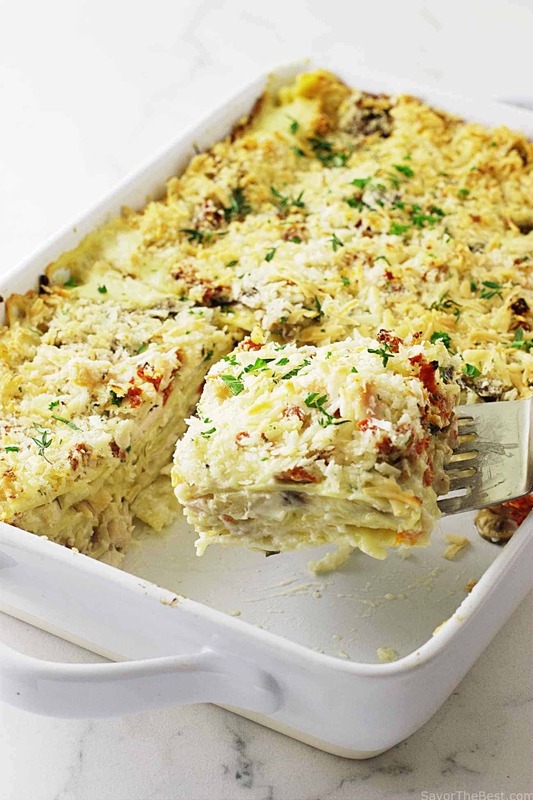 We’ve made all kinds of lasagna but never chicken nor one with einkorn noodles. This looks delicious! An ultimate comfort food! Freshly made einkorn pasta, healthy lean protein..this is a perfect weekday dinner!